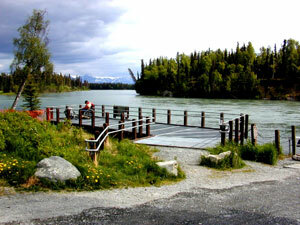 An accessible fishing platform at Bing’s Landing. Where else but Alaska can you see bears, bald eagles, whales, wolves, moose, and hundreds of other species in their original and undisturbed natural habitats? Alaska’s vast wild lands and dramatic landscapes offer many recreational and wildlife viewing opportunities for its able-bodied citizens and visitors. For people with disabilities, however, accessing the outdoors can be challenging. Alaska is continually striving to provide better access to its parks and recreational facilities and promote outdoor programs for people with disabilities. In this section, the Alaska Department of Fish and Game Watchable Wildlife Program has consolidated information about various local, state and federal facilities and provided links to many other resources related to outdoor recreation and wildlife viewing access. Section 504 of the Federal Rehabilitation Act of 1973, as amended, and the Americans with Disabilities Act, guarantee Alaskans and visitors the right to equal access. To learn more or to request modifications or accommodations relative to a disability, please visit State of Alaska ADA Coordinator's Office website.